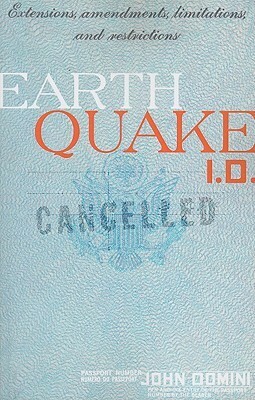 Lettie Prell’s review of Earthquake I.D. Lettie Prell's Reviews > Earthquake I.D. A wonderfully satisfying read, John Domini's new novel rewarded me with an intriguing portrait of another world, fascinating characters, and a hint of the mysterious in a modern setting. The world is that of Naples, Italy, riotously overcrowded, yet nevertheless conveying a sense of joyous celebration of humanity en masse. The characters are the Lulucitas, an American family on a mission to help the victims of the city's latest earthquake. The novel focuses mainly on the mother, Barbara, a woman whose mind is as deeply divided as the post-quake setting. The mysteriousness is the apparent faith healing abilities of the Lulucitas' youngest son. The novel takes us on an Amalfi Drive of plot complications, as we find out secrets of the city, the family, and more. A tremendously rewarding novel, at every level. Sign into Goodreads to see if any of your friends have read Earthquake I.D..